Temple of Esther and Mordechai - Iran loves Israel? Home » Religious Sites » Jewish Religious Sites » Temple of Esther and Mordechai – Iran loves Israel? Temple of Esther and Mordechai – Iran loves Israel? The iconic character of “Esther” (Star), the Jewish Queen of Persia, and the historical significance of the Temple of Esther and Mordechai in the City of Hamedan. This search of a non-Jewish Iranian filmmaker delves into the pages of the Persian cultural heritage and mythology relating to Esther, who is regarded as the savior of the Persian Jews. Today, the Iranian Jews are known as the children of Esther. The normally hostile Iranian regime took the rather unusual step of adding a Jewish holy site to its National Heritage List. On December 9, 2008, Iranian news outlets reported that the tomb of Mordechai (Morduk) and Esther (Ishtar), heroes of the Purim saga, would now be under official government protection and responsibility. The move cast a brief spotlight on the site, which is well-known to Iranian Jews but largely unfamiliar to those outside the country. And with Purim being celebrated this week, it is worth taking a moment to ponder this relic of our ancient past. Mordechai and Esther lived during the rule of Ahasuerus, a Persian king who is also identified as Artaxerxes (possibly Artaxerxes II, who lived from 435 or 445 to 358 BCE). The mausoleum housing the shrine of Mordechai and Esther consists of a simple brick structure crowned with a dome which was built some five to seven centuries ago over the underground grave sites. The design is traditional Persian architectural style (known as Emamzadeh). It is located in the northwestern Iranian city of Hamadan, which is about 335 kilometers west of the capital, Tehran.The origins and contents of this shrine are cloaked in legend and mystery. According to one tradition, Hamadan is believed to be the site of the city of Shushan, which played such a central role in the events described in the Book of Esther. Hamadan, known in antiquity as Ecbatana, is in the Kurdish region of Iran. Mount Alvand, which overlooks the city proper, hosted the summer residence of Persian royalty of the Achaemenid Empire (the period when the Purim story). Tradition has it that Esther and Mordecai — after spending their final years at the royal resort — were buried in the city, next to one another, with a shrine constructed over their graves. Some historians claim that the current structure belongs to Shushan Dokht, the Jewish queen of King Yazdagerd I (ca. 399-420 CE), who is credited with securing permission for Jews to live in Hamadan. Various travelers down through the ages took note of the site, with the first having been Benjamin of Tudela, the famed 12th century Jewish explorer. The shrine was destroyed by Mongol invaders in the 14th century. In 1971, in honor of a national celebration of 2,500 years of Iranian monarchy, the Iranian Jewish Society commissioned architect Yassi (Elias) Gabbay to undertake a renovation. Iranian Jews revered the shrine, and many would travel to Hamadan to observe Purim there by reading the Megillah alongside the tomb. Others held family celebrations, such as bar-mitzvahs or circumcisions, at the site. The entrance to the building is said to have been built intentionally low, in order to compel visitors to bow their heads upon entering, thereby engendering a requisite attitude of respect. Inside the main hall, which is adorned with Hebrew inscriptions, lie two large, decorated wooden boxes, or trunks, below which are said to be the final resting places of Mordechai and Esther. A small synagogue adjoins the tomb, and the site is also considered holy by Muslims and Christians, who come to pray there as well. In 2011, Iranian authorities downgraded the status of the tomb of Esther and Mordechai. An official state news agency has publicized the Purim story as a Jewish massacre of Iranians. Officials recently removed the sign that identified the mausoleum of the biblical figures in the central Iranian city of Hamadan as an official pilgrimage site. Next to the mausoleum lies a large hollow in the ground, which Iranian Jews believe to be an entrance to a tunnel that stretches all the way to Jerusalem. As early as 1215, Rabbi Menachem Ha-Hevroni wrote that while visiting the Galilee, he came across the tomb of Queen Esther, “who, during her lifetime, had instructed her son Cyrus to bring her there [for burial]”. 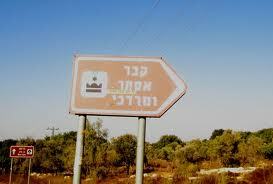 Later pilgrims mentioned the site, and noted that special celebrations were held there on Shushan Purim. After the area was liberated in Israel’s War of Independence, a group of Safed Jews went up to the tomb on Purim in 1949 and read the Megillah there to revive the long-standing custom of previous generations. Hence, we have two conflicting traditions as to where the protagonists of the Purim story are buried, with one placing them in Persia and the other right here in Israel, much closer to home. The question of whether the shrine actually marks the resting place of Esther and her uncle remains unanswered, and is perhaps unanswerable. And while we can not say with any certainty which of the two traditions is more authentic or correct, of one thing we can all be sure: the deeds of these two great Jewish heroes will never fade from our collective memory. As the Megillah (9:28) itself tells us: “And these days of Purim shall not pass from among the Jews, and their memory shall not elapse from among their descendants”.